Resort Fees: HANALEI BAY RESORT WILL CHARGE YOU $20 PER DAY FOR RESORT USAGE. THIS INCLUDES POOL TOWELS,AMENITIES AND WIFI. THERE ALSO IS A $6 PER DAY PARKING FEE PER CAR. THE GUEST IS RESPONSIBLE FOR PAYING THESE CHARGES WHICH ARE DUE AT CHECKOUT. Resorts that require “resort fees” for guests staying on the property solely make the decision on what the amount of the fees will be and it is out of the control of the owner of this property. These fees are subject to change at anytime without notice and could change before your arrival and could be different than the original fee stated in your reservation. We make every effort to communicate changes in fees as soon as we are notified. The regular occupancy for 3304 is 2. Guests are obligated to disclose the actual number of occupants prior to arrival. At no time should anyone sleep on sofas. We loved Hanalei Bay Resort and our condo with the breathtaking view. Waking up and seeing the view of the bay from our patio was an incredible way to start each day. Having the ability to walk to the beach was a huge bonus. The North Shore of Kauai was the most beautiful place we've ever been and that says a lot as we've traveled extensively. We plan on returning in the near future. It simply is a magical place! Incredible, panoramic views of Hanalei Bay and the surrounding Makana Mountains. Conviently located close to all of the resort amenities and from the parking lot with no change in elevation, it is just a few steps and 2 flights up to the condo. With a King bed and a sleeper sofa this unit can comfortably sleep 2 adults and 2 children. A well-stocked kitchen and full size washer/dryer offer convenience for your stay. Our spacious lanai has a table for two. The two sides of the lanai are divided by tropical plants. You will be very comfortable sitting on this covered lanai taking in the sites! As you enter the unit the bathroom is to your right and the kitchen straight ahead. Passing through the kitchen you come into the living room and dining area. The stairs leading to the loft are on the left. The lanai faces west toward Bali Hai. great facility, great location and has potential. The main issue with this is that the pull-out is not sleepable. Completely worn out and not suitable for anyone really. The condo should not be advertised as able to sleep four until this is fixed. If there were adults on this they would have been very disappointed. As it stands we had our 11yr old daughter on it and it was bad enough. other than the sleeping arrangements all was well, but have to give a low rating as a good nights rest is essential. Thank you for taking the time to post for us for unit 3304 at the Hanalei Bay Resort. This unit does have a great location and the views are second to none. Just perfect! We are sorry you had an issue with the sofa sleeper but it did confuse us to see your comment because that mattress was purchased about a year ago brand new. The sofa also was reupholstered in recent years. This unit may have the best view in the entire resort, and its location is very handy to the main pool, tennis courts, and parking. Sitting on the lanai to watch the bay and mountains, as well as the sunset, makes you feel you are in paradise. On the other hand, the unit needs updating. The TV is very small and in a very inconvenient location. None of the remotes worked. The bag with spare batteries was useless, as they were all corroded. Thank you so much for your comments and taking the time to post for the unit 3304 at the Hanalei Bay Resort. We do agree with you that the view is unbeatable from this unit! The location of this unit is convenient to everything and you do have a front seat for the sunset! The unit itself is depicted correctly on the website and the pictures are clear as to the decor and its features. Therefore when booking, the guests can decide for themselves if the unit is something that they would be happy with. The house keeper did check the remotes before your arrival and brought one over from the unit next door (which worked fine) because the one in the unit did not work. This is her standard procedure and check list. Because she had first checked the battery of the bad remote, she retrieved one from the battery bag. She did not see any corroded batteries there. She also had checked the DVD remote and found that the power button did not work but it was still functioning by the open/close button option. We therefore are not sure, what might have been the problem but we wish you would have called us about it so we could have come and helped. The resort is well located on the north side of the island. Wonderful hiking is close. There is a small shopping center nearby with a nice grocery store that has a pharmacy. There's also a small medical clinic, which we used because my husband had the flu, with very quick and friendly service. Hanalei Bay Resort has a nice lounge that serves medium quality food and expensive drinks. The pool is great with a swim up bar, lots of chairs and the occasional wine or coffee hour. The beach is small but fine for families. Maybe a bit noisy for retirees or a couple seeking romance. The beach is shared with the St. Regis Hotel so it can be a bit crowded. The beach is also a bit of a walk - you definitely need a beach wagon if you're hauling kids, chairs and toys but the resort also has a shuttle. Condo #3304 had nice views, close to the pool and not too far from the beach, It was clean and adequate with enough kitchen equipment. The wallpaper and furnishings are dated and I would recommend some replacements. I would recommend Hanalei Bay Resort and wouldn't hesitate to rent there again. The complex is old, however the unit is very clean. 3304's view is spectacular. Most of the time there was nobody in the room next to us, but the balcony is not private if others were also present, so we took turns enjoying the view allowing each privacy. The condo is very tiny and adequate for 2. If HBR were to ever rebuild the buildings (as the landing and lanai cement was cracking from settling or movement of the building), I would suggest to spend less space on the stairs, invest a lot of money and have interior elevators (to escape moisture wear and tear on the elevators and to provide disabled guests access to the upper units) and use the extra footprint for expanding the size of the condos. The current footprint has a lot of space used for stairs and it just seems this space would be better spent for living space and an elevator. Stairs are still required for fire purposes, but it seems interior elevator access would be more practical for the next rendition of the resort whenever that happens. The unit has a small stove and microwave, so cooking was easy. The kitchen is well stocked with tools and utensils. The view was incredible and that is the main reason for the trip, so we were very pleased. 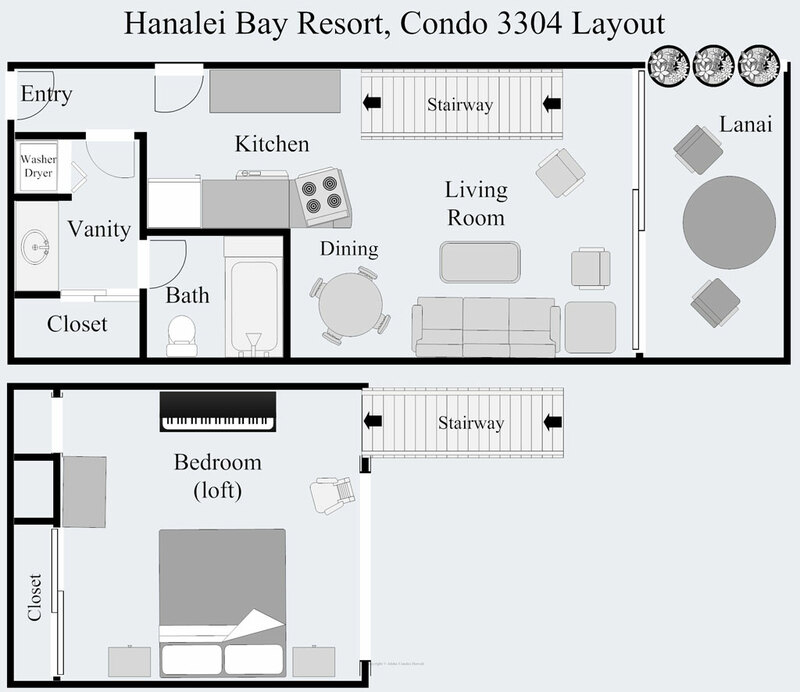 We appreciate you taking the time to give a review of the unit 3304 at the Hanalei Bay Resort. Thank you for noting it was clean, the cooking abilities and the incredible views! This unit is larger than some of the others of the same because the owners did install the loft bedroom for extra space. The resort it self does have a variety of sized units to accommodate different needs. This unit can be booked with the unit next door with an adjoining door so that if one wanted extra space that might be something to think about. The resort does not have plans for any renovations to extend the condo sizes but they are continuing to work on the lanais to restructure them. It is a multi million dollar project that is on going. We are glad you were pleased with the view as it is pretty amazing! everything was wonderful at Hanalei bay resort. I didn't care for the bed room in the loft in 3304. Thank you for your feedback and taking the time to post a review for the unit 3304 at the Hanalei Bay Resort. It is a wonderful resort with lots of great amenities and the views from this unit are exceptional and are what memories are made of. The unit does have everything you might need for a great vacation. Everything was just great😊 The only thing I wish to improve was the privacy between us and the other unit. There should be a natural looking divider there. The place was very clean and the views were jaw dropping. Highly recommended! Thank you for the great review. We are always happy to hear the guests had enjoyed the condo. The views are exceptional and are much better than the pictures can even show. The privacy divider has been tried but there does not seem to be a good solution. Thank you for your recommendations and we hope you see you again! Really nice place! View from this 3rd floor unit (plus elevated from beach) of Hanalei Bay is incredible! Nice sunsets and views anytime of day! Lanai outside is large, so sharing the deck (nicely divided by potted plants) with next door unit wasn't a problem. Resort grounds are green, lush, and very nice. Unit 3304 is well kept and very comfortable. Upstairs bed is comfortable; pull out couch bed isn't the best for large people (like most couch beds with bar support); putting mattress on floor works well and is comfortable. Resort pool is beautiful. Walk down to beach through overhanging trees is beautiful. Really enjoyable stay and exceeded my expectations! We appreciate you posting a review for us and the great rating. We always enjoy hearing the stay exceeded your expectations! Thank you for noting the condo was kept and comfortable. The views are really pretty incredible and the resort has a lot to offer. We hope you will come again soon! 3304 has spectacular views from balcony over Hanalei Bay and nearby mountains. All kitchen amenities are comprehensive and good. Large comfortable lounge/diner, spacious bathroom & adjoining washroom. Excellent washer & dryer. 2nd floor mezzanine bedroom is lovely. Fantastic condo for two. The resort is well situated, maintained to a high standard, lots of private and safe parking. Great main pool. Everybody was very friendly. Easy access to local beach directly from property though our preference was Hanalei beach. Hanalei is a great little town and laid back. The resort was very clean and the staff was most attentive and professional. The view from our Condo was right out of a postcard for Hawaii. I would highly recommend the resort. My husband and I have visited Kauai many times and enjoyed our recent stay in 3304 at HBR. We've stayed in other condos at the resort, but the Bali Hai view from this balcony is spectacular. The only reason I omitted a star was the shared balcony. Luckily, we had a very nice couple next door, but there were plenty of times we did not go out in order to give them some privacy. If either unit had noisy or inconsiderate guests (or children) it could negatively impact your stay. We appreciate your time in giving us your review. It is exciting to hear you loved this unit the best as it sounds as if you have stayed at the resort possible a number of times. We hope you can come back again! Let me start off by saying that we could not have picked a better place to stay in Kauai! This place had a view that was stunning! Yes the condo could have been more updated but if it were more updated, we would not have been able to get the great price that we paid. Besides, who cares what the furnishings look like? You are in Hawaii.......go explore! The view is the most important thing in my opinion.....a place to sit back and watch the sunset. The grounds were BEAUTIFUL. The pool is HUGE and absolutely stunning. It had 2 waterfalls, a beach area with sand, and the hot tub had a waterfall with a pebble bottom (very delightful after a 22 mile hike). They are in the middle of building the pool bar which from what I can tell is going to be pretty awesome! The paved trail to the beach is really cool. Feels like you are walking through the jungle. We did not spend a lot of time down at the beach as we were out exploring all the island had to offer. Graham was an absolute delight! We had several special requests and he made sure that he fulfilled every request. We originally had this place booked for 4 nights and then we were camping 2 nights while hiking the Kalalau Trail. We figured that we would just stay in a cheap hotel after our hike and stay the last night of our trip at a 5 star resort. We loved the room so much that we decided to ask Graham if we would be able to vacate those 2 nights that we would be camping and then check back in to stay our last 2 nights. He was more than happy to fulfill our request since there was nobody checking in during that time period. I also requested a late checkout since our flight was at 5:15. The weather was so beautiful outside that we wanted to go surfing for a few hours before heading off to the airport. Being able to have the late checkout was super awesome because we were able to have a hot shower before boarding a plane for 10 hours. Thank you Graham! If you want a really enjoyable place do stay that is affordable, you should totally book this room! We WILL return to Kauai one day and this is the room that we will stay in. It is always nice to hear how much our guests have enjoyed their selves during their stay with us. This unit is in a great location in the resort and being on the third floor does allow for the most spectacular views of the ocean, the bay and the mountains! Sitting on the lanai will store memories for years to come that will never be forgotten. The resort does have a lot to offer with its 22 acre facility with many amenities including the direct beach access as you did mention. Thank you for also mentioning the how accommodating we were in your request as we do try to make every stay a good experience. We are so glad to hear you will be returning and we look forward to serving you once again. Hanalei Bay Resort is an awsome place. Our vacation was exceptional. Great beaches, great pool, great grounds, friendly staff. The view of Hanalei Bay from our condo was amazing! A short walk to the beach and the St Regis Hotel. Princeville is elegant and beautiful. We loved going to the beach, snorkeling, kayaking, and hanging by the pool. The resort is very peaceful and quiet, away from busy streets. The condo had everything we needed. My only comments are that the sleeper bed is not very comfortable (ok for smaller children, not adults) and I would prefer a dresser in the bedroom instead of the piano. Aside from that we had a great stay and hope to return. The view is amazing! Lanai is nice but shared with the next door unit separated by potted plants. The room definitely needs updating. We booked the room for 3 people expecting to use the pullout sofa but there were no linens left for the pullout except for a blanket in the bin located in the loft. It was almost midnight so we called the front desk and they were able to lend sheets which we were very thankful for. But I would definitely not recommend this room for 3 people as the couch is very old and the pullout mattress has seen better days. We don't expect luxury for the pullout but it was not comfortable at all. The main bed was great. The stovetop is electric which is fine but some burners are very crooked and the lower outer frame of the oven would shift out of position if you accidentally nudge it walking by. Bottom line, it could use a new stove as well for sure. The AC unit took a while to cool the place and has seen better days. Took some time and fiddling to figure out how to get the AC vents open. The bathroom is a nice size. They have two tired beach chairs in the closet and a styrofoam cooler. In my opinion, if a little updating was done on furniture and appliances this would be a great unit for the price. Magical is a great way to describe what our island and resort has to offer. Thank you so much for the glowing review! It makes us so happy to know that your honeymoon will be a cherished memory forever and that we could be a part of it. The views from this unit are amazing and set the mood for each day! We hope you will allow us to accommodate you again in the near future. Mahalo for your business. Perfect spot for "base camp"! This unit has a great view of the bay, all the amenities one could ask for and I really appreciated the obvious efforts that were made to provide the visitor with everything they could need. It was way beyond the norm and showed the attentiveness to try to make a visitor's stay as pleasant as possible. I go to Kauai to hike and escape crowds and this was the perfect location as it is near everything. Really nice place. Many hours of research finally led us to 3304 HBR. Please try this unit, the views of bay and gardens fantastic, condo well stocked with plenty of room for our family. Our breakfast on lanai perfect start to each day with easy access to anywhere on the north shore. Did early morning Na Pali coast boat ride and and we were in Hanalei within 15 minutes. Very exciting day and highlight of our trip. Had lovely lunch at St. Regis and we all agree we were far more comfortable staying at HBR. Stayed 4 nights and because we were out most of the day the proximity to beaches, restaurants and sight seeing ideal. Thanks aloha condos for the gift bag filled with exciting goodies, our 15 year old loved the chocolates, very thoughtful and appreciated, especially the coffee!! We loved staying here and can easily recommend this non smoking resort to anyone else looking for a really good place to stay. The weather was gorgeous too. Thanks again. Just spent a week Hanalei Bay Resort later resort in unit 3304 and found it to be like home away from home. Comfortable million-dollar view of of Bali Hai. Very large bathrooms which are really nice benefit when spending lots of time at the beach and pool. You'd spend hundreds of dollars more to stay at the St. Regis next-door. This place was a gem. We've stayed in Hanalei Bay Resort before, but this was less expensive, had a better view and a killer location - with quick access to the beach path and very close to parking (which is an issue if you are carrying groceries). The agents alohacondos.com, provided great service and their communication was excellent. The only drawback is that you share a lanai with the condo next door, but there are carefully placed plants so it's not really an issue. It also provided great views for my 2 year old son to do some chicken spotting. Check-in was easy and quick. front desk gave us the room keys and had an attendant load up his golf cart with our belongings.He came to our room with everything (including all the groceries from Costco). The room was clean & neat & had all the ammenities seen on the video & pictures. The attached bedroom came in handy so extended family could have their own refrigerator, microwave & TV. The main room was large enough for cooking & dining for all 3. The view was clearly unobstructed from the Bali Hai view and coud see surfers daily in the water. The a/C takes a while to cool off room & there is no vent for cooking odors. Need to open doors for cross ventilation. The screen doors need maintenance. The W/D was large & ample & came w/soap & oxyclean detergent enough for 1 week. A slight musty odor from loft where king bed is located. There's Bbq'd food for purchase at the pool during lunch hours however no bfst or dinner cafe available. Location close enough to supermarket in Princeville w/reasonable prices & good selections. Haena state park & Tunnels beach only 30 min ride to north. The pool was adequate,pleanty of chairs & not crowded. Best overall: view, location, A/C, W/D, kitchen. On third floor -got a daily work out walking up & down. We really enjoyed the condo and it exceeded our expectations, particularly given the value. The resort is great with a beautiful pool, access to the beach (wtih snorkeling / surfing) and extensive tennis options (courts, clinics, lessons, friendly people to play with). For the condo, having the kitchen was very helpful as the resort restaurant and bar are closed. The views are spectactular and the two floors of living makes the condo feel more like a house than a hotel room. While some of the fixtures are dated, they are nice, clean, and well attended. I am 6' 3" tall and didn't have a problem with the ceiling fan or slanted ceiling in the loft bedroom as did another reviewer. The mattress was also fine and comfortable different from the other reviewer's opinion. In terms of negatives, one does have to get used to the going up and down the stairs for the bathroom at night and the bedroom area could use a dresser. There was plenty of closet space throughout, but no dresser for clothing. (I'd recommend swapping the piano in the bedroom for drawers.) There is no elevator in the resort so while the top floor has the views, quiet, and space, you have to be ready to walk up and down the stairs. All in all, we had a great trip and really enjoyed our stay. Aloha Condos was prompt and courteous while also allowing us to check out late to maximize our time prior to the flight home. We really enjoyed staying at this condo, with a nice view and good overall location. This condo was perfect for us. We like to cook our own food so the kitchen was a bonus. There is a fresh fish market in Hanalei which we found early on that was spectauliar. The location was a bit remote which we also liked. Having the bed in the loft was a struggle as we are both tall so we needed to be conscious of the beams and the fan. The bed could use a new mattress, which I am sure could be a great expense in Hawaii. Kristen and the staff at Hanalei Bay were all very accommodating.